Make this adorable huggy mother’s day card craft for kids! Print the free printable template for the card, and then follow the directions. This Mother’s Day, I decided to include something kids can make for moms too! It requires a little bit of Daddy/teacher supervision, but is totally kid-made. I’ve designed it to help a little with writing skills with simple words. 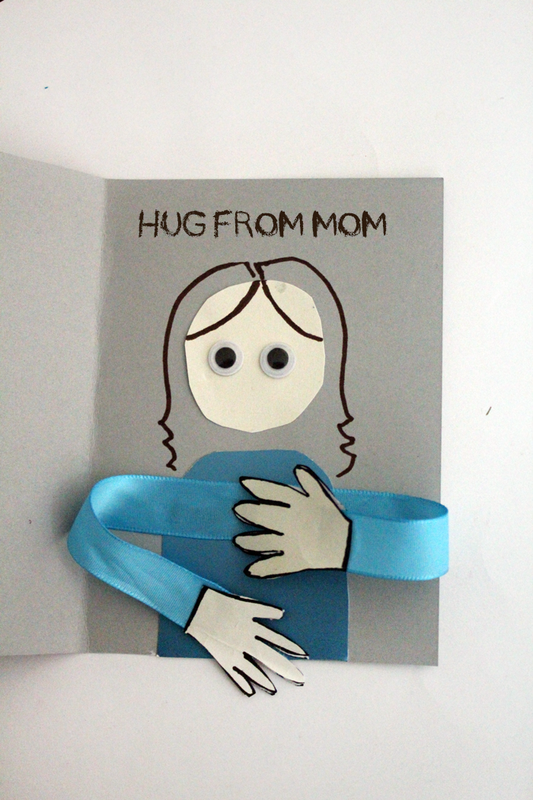 It is an adorable 3D card that shows mom how much her hugs mean to us. And which mom doesn’t love a little kid hug? She will simply adore this card! 1. Print the card on the bristol. One sheet makes two cards. Cut it across the center to split. Fold it in half. 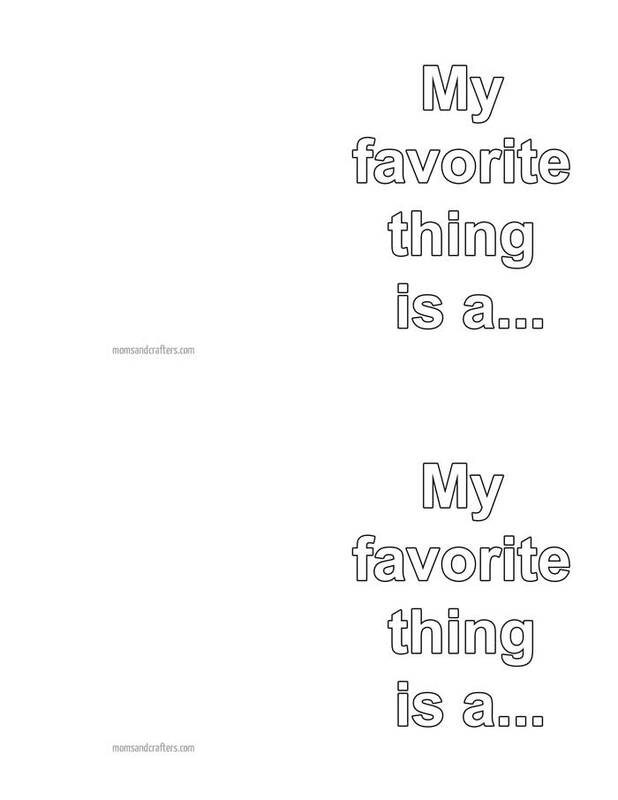 “My favorite thing is a…” appears on the front, and the “momsandcrafters.com” watermark on the back. The inside is blank. 2. Have the child color in the front of the card. 3. Make a simple elongated half-oval shape for the body. Make a simple round shape for the head. Glue them onto the card. 4. 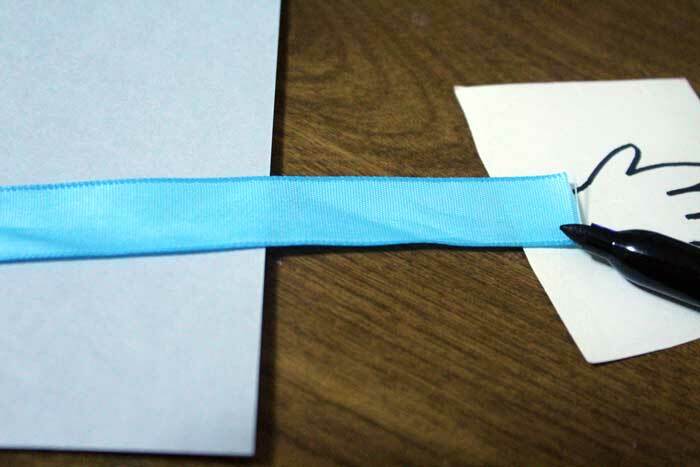 Measure the ribbon by placing it across the “body” and folding the ends over so that it resembles hugging hands. Center it on the body, toward the top, and glue only where it overlaps the body, leaving the ends loose. 5. Measure the ribbon width to guide you in making hands. Measure two front-to-back pairs. 6. Glue a pair of hands on each side of the ribbon, sandwiching the ribbon tip in between. That way it looks great whether mom’s arms are open or closed. 7. Glue on googly eyes, and draw on hair in Mom’s color. 8. Have the child write “hug from mom” above mom’s head. 9. Place it in an envelope, and give it to Mom! She is going to love it, and give the biggest hug ever in return! Crafts for kids, Holiday and Seasonal crafts, More printables, Spring crafts. Bookmark. This is so cute! Pinned! This is so cute and what a great idea. It´s so great idea. Thank you so much for that.